STOP!!! Don’t click away and write me off as nothing more than a schmaltzy romance watcher… this movie does itself an injusttice with its name. I worked in a video shop for a while and people went out of their way to avoid this movie, due to its name, the front cover and the star, Jennifer Aniston. So, let me put a few things in perspective for you immediately. 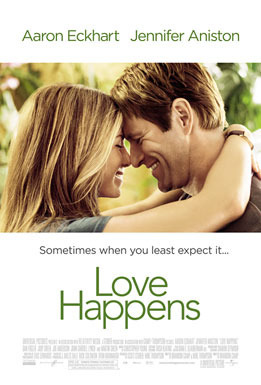 The name, Love Happens.. yes it does.. and in the context of the movie, its understandable but without having seen it, it seems trite. The front cover? Okay its the gorgeous Aaron Eckhardt and Jennifer Aniston, smiling cheesiliy…. once again, it doesn’t do the movie justice as the love story is secondary to the script. Thirdly, Jennifer Aniston as the star.. Look, I won’t do Jennifer Aniston bashing.. I don’t mind her but I’ve always considered her to be just a bit of fluff. She is also billed as the star and that’s not really true either. I think her role is very much a secondary role to the movie. So let me tell you a little about the story.. Basically, Aaron Eckhardt plays Burke, a widower who has made a name for himself after writing a best selling book on how to move on from grief. Dan Fogler plays his friend and manager Lane who keeps pushing the business of grief, although the friendship between the men is obvious. While facilitating a grief workshop in the city he used to live in with his wife, he has a chance encounter with Eloise (Aniston) and they start a bit of a romance. I can’t emphasise this enough… the love story is completely secondary to the guts of the movie. The budding romance, coupled with being in the city that held so many memories means he has to start dealing with his own grief, something he has avoided. John Carroll Lynch plays Walter, a blokey kind of guy who is trying to put his life back to normal after the death of his son and gets encouraged to attend the workshop. His character is so vulnerable (and played brilliantly) and Burke takes him under his wing to some degree. Add all this to the fact that Burke’s father in law, played by the absolutely brilliant Martin Sheen, comes to confront Burke over the death of his daughter.. and this is a movie with some substance. The characters in this movie all go through various stages of grief from avoidance, anger, sadness and some sort of acceptance. It is so much more than a love story. Jennifer Aniston’s role is really a catalyst for Burke to start to think about moving on and I think she plays it well, albeit, very much in Rachel from Friends style. Aaron Eckhardt plays a good role and does it justice. Dan Fogler gives lots of comic relief but plays the role with a good balance of comedy and emotion. John Carroll Lynch is absolutely brilliant as the macho builder come bereaved parent. He is the movie stealer along with Martin Sheen, who also plays a bereaved parent. These two roles were well cast, well executed and capture the hearts of the audience. This is in the Romantic Comedy genre, which I guess it does fit into, but has so much more substance that your normal romcom. It delves into the subject of grief with credibility. Now I’ve probably made it sound quite deep and miserable, but it’s far from that. It is a genuinely funny movie. There are numerous laugh out loud parts in it.. but there are certainly those moments where your throat starts to hurt from trying to hold the tears in. All in all, I think its a really well balanced movie. It’s an okay movie, I guess, but is mostly good because of Eckhart’s performance. The guy has a real charm and likability to him that really has you hold onto his character right from the start. However, the script sort of lets him down. Good review.